To understand the premise of arthroscopy, consider the two Greek words that make up the term—arthro and skopein. Arthro means “joint,” while skopein means “to look.” As such, arthroscopy means “to look inside the joint.” With this in mind, a shoulder arthroscopy involves the use of a small camera called an arthroscope. It is inserted into the shoulder joint, allowing the orthopedic surgeon to see detailed images needed to guide each movement. Contrary to open surgical procedures, instruments used during arthroscopy are thin, and do not require a large incision. Without question, this extends the scope (no pun intended) of arthroscopy, as surgeons use the procedure for diagnostic purposes as well as reparative means. A clear benefit of the arthroscopic technique is that it allows surgeons to access parts of the shoulder by navigating between muscles. An example is arthroscopic shoulder replacement, as conventional shoulder replacement procedures involve cutting through the rotator cuff muscles to reach the shoulder joint. 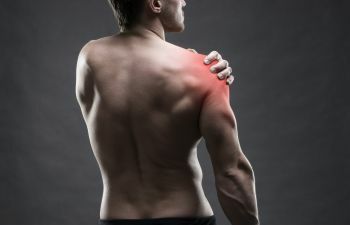 While this results in far less post-surgical pain, this technique also contributes to an easier recovery, and patients can avoid risks associated with open shoulder procedures. Even so, it’s important to understand that not all shoulder repairs utilize the arthroscopic procedure. An initial consult and comprehensive diagnosis is necessary to determine which surgical approach is best for you. With a practice focused on minimally invasive, arthroscopic procedures of the shoulder, knee, elbow and hip, Dr. Kerisimasi Reynolds is a highly respected Orthopedic Surgeon with a special interest in treating active populations and athletes of all skill levels. In fact, Dr. Reynolds is fellow-trained in sports medicine and advanced arthroscopy, and has extensive training and expertise in complex conditions of the shoulder. To schedule a consultation with Dr. Reynolds, or for additional information regarding shoulder arthroscopy, call today!